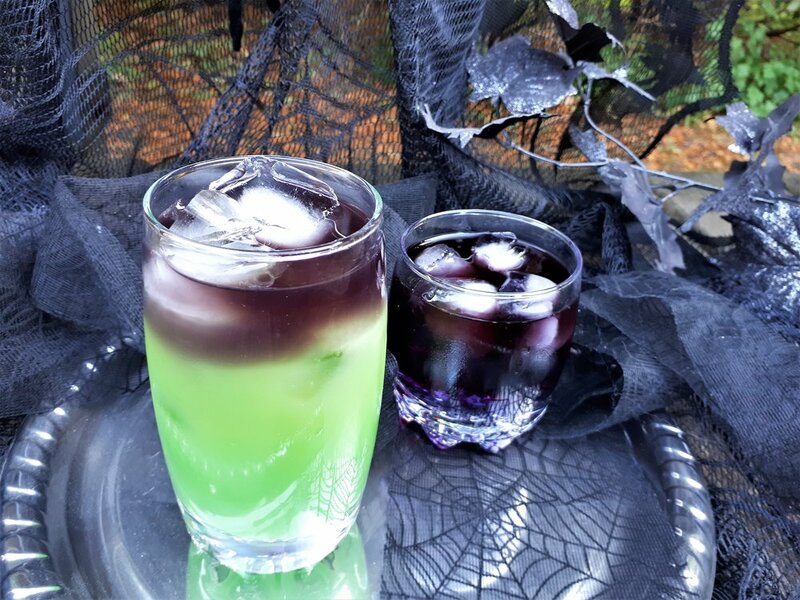 I had some fun this past weekend experimenting with Hound Black Vodka for Halloween cocktails. I find it tastes just like normal vodka but is special for the season because of its colour. The best results came when I added the black vodka separately to make layers. This made an awesome ghoulish style for serving guests this Halloween. I gave this cocktail it’s name from it’s bright green colour and block of black across the top. The Apple Sour Puss Schnapps give this cocktail a taste of the season. -Pour Sour Puss, Blue Curacao, Orange Juice and Ginger-ale over ice. Stir. -The cocktail should be bright green at this point. If not, add more blue curacao until desired lime green colour is achieved. -Slowly pour Hound Black Vodka into the glass. Make sure the pour is slow and gentle so that the vodka sits on top of the drink and does not mix with the other contents. -Add Blue Curacao, Raspberry Sour Puss and Ginger-ale. Stir. -Drink should be bright purple. If desired colour is not reach add more Raspberry Sour Puss or Blue Curacao to reach desired results.